It is a very old breed, mentioned all the way back in the 13th century. It originated in the area in which Morocco, Libya, Tunisia and Algeria now stands. 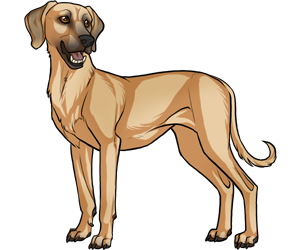 The breed was thought to be related to Saluki's, but DNA testing has proved this to be incorrect. Mud/dirt will fall off the coat by itself. The Sloughi is also known as the Arabian Sighthound, though it is not Arabian. Only chiefs and kings were allowed to own them.